Your Money or Your Life - Trading Your Work Life Balance For Money? Are you trading your life for money? One of my favorite books on personal finance/lifestyle choices is Your Money or Your Life by Joe Dominguez and Vicki Robin, and it explores this very topic in easy-to-understand, clear and concise language. I have read it cover to cover several times over, and it remains a staple item on my bookshelf. In fact, it was part of my taking a risk in leaving a high-paying career in the entertainment field for self-employment and freedom from schedules and bosses. Working at a job I didn’t like was financially rewarding for quite some time, but eventually it became a black cloud draining the life out of my soul. I realized I was trading my life away for money, and I had had enough; I up and quit and have been on my own for years now. I was no longer trading my life for money and it was the best decision I have ever made. I bring this up today because I have recently spent some time with people who, on the surface, have it all – a high-paying job, a beautiful house, two relatively new cars in the garage and the standard 2.5 kids playing in the backyard. But beneath the facade that I saw some cracks in were people not very happy with with their place in the world. They had no more choices – they had to work at the job they hated 50-60 hours a week just to pay the mortgage, pay for those new cars, and pay for the private schools, leaving them almost zero time to live life. Sure, they were alive, as they got up in the morning, drove to work, had lunch, drove home, had dinner, and plopped in front of the TV while trying to forget they had to do it all again the next morning, but they weren’t living. It was painful to hear about how time was passing them by and how they needed to keep an unrewarding job just to make ends meet – the very ends that they themselves had set up and thought that they wanted. It turns out that maybe they didn’t. So back to my question at the very beginning; Are you trading your life for money? Is money more important than your life or is your life more important than money? Sure, you could be working a job you hate AND not have any money which happens all too often for many people, but most people either make a lot of money but work their butts off at jobs that take up all their free time leaving them with no life, or they don’t make a lot of money but spend their days either working at a job they enjoy or for themselves at home. I am really curious as to what you guys are doing on a day to day basis. Are you happy at your job? Do you hate your job? Have you considered trading in your job for less money but more happiness? If you haven’t read Your Money or Your Life, I highly recommend you do so as soon as you can. This goes for those of you who are happy at work AND for those of you who aren’t. We only get one go-around here on planet Earth, so you have to make the most of it. For myself, I couldn’t imagine working for 2/3 of my life for someone else just to make ends meet, so I downsized, cut back, and rearranged my lifestyle so that I could work less, make less, and yet still enjoy my life. I didn’t want to think back at 75 years old and say “What the hell just happened to my life?” because I missed out on experiences/choices because I was busy trading my life just for the money. What does your future self want to tell your present self about how the next 30 years is going to look? I now know mine won’t tell me I missed out on anything! Sometimes, It Pays To Spend More On A Mac. Coming Up This Week At My Two Dollars. I can tell my work/life balance is starting to be compromised and I’m working on putting it back on track. I don’t want money to really rule EVERYTHING around me. I can personally relate to the idea of being in a job that I thought was going to the right one for me but turned out to be a drain on my personal well being. I’m a trained chef and I once took a restaurant job as sous-chef hoping that it would be a step in the right direction for me. It took exactly two weeks to realize that all I could think about while I was at work was how much I wanted out of it. I was being consumed by my own negativity about my job and even though it was the type of work that I enjoy, I hated the job itself. No amount of experience was worth sacrificing my mental well being. I think you make a lot of great points in this article, and the question is one that everyone should put a lot of thought into. One area you didn’t mention though is retirement. For the people who work jobs they hate for the money, at least they know they’ll be able to eventually retire. 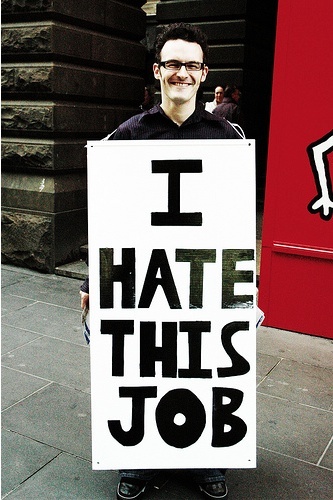 People who choose low paying jobs might be OK too, if they plan extremely well. But they may find themselves forced to work until the day they die because they can’t afford not to. Not to say one path is better than another, this is just another aspect to consider. I personally strive for the ideal of plenty of money AND happiness, which I think is achievable if you’re determined enough. What an important topic! I’ll have to check out the book, Your Money or Your Life.